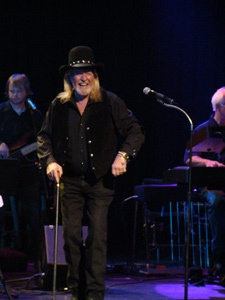 Con was pleased to perform again this spring in Pigeon Forge, TN. 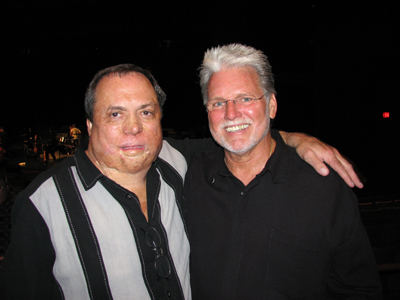 His good friend Mel McDaniel was also on the bill. Con performed for many years in the popular family vacation hub, and says it feels a lot like going home. 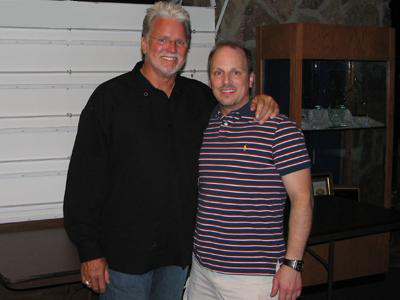 He is pictured here with Tim McAbee, show promoter and owner of First Class Productions. Con took time to pose with the band backstage before the show. 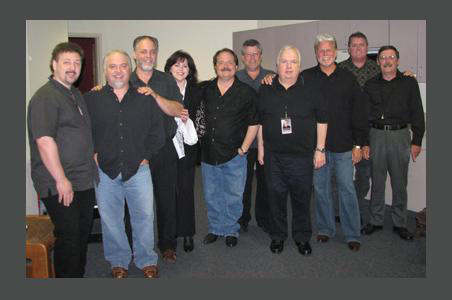 L-R: Greg English, Tony Creasman, Stan Williamson, Ruthie Akers, Burton Akers, Tim Hunley, Herby Wallace, Con, Kenny Hunley, and Ken Jackson. A good lookin' bunch, and everybody's ready for some fun!! Con's good friend Mel McDaniel did a terrific job in the first half of the show. He performed all of his great crowd pleasers like "Stand Up", "Baby's Got Her Blue Jeans On", and "Louisiana Saturday Night". The second half begins and Con is fired up and ready to rock! The crowd is ready for some soulful Con music! Country Tonite is a terrific venue - the sound is great, the stage is rounded so that the performer doesn't seem so far away, and they have great audio/visual gear. Here Con is shown during the performance on one of two big jumbo screens positioned at each side of the stage to enhance viewing for the audience. Some great stage shots of the band! All these guys love playing with Con, and Con is just as proud as he can be of each and every one of them! As Con's performance comes to an end he takes a moment to talk about his new single, "Hollow Man". 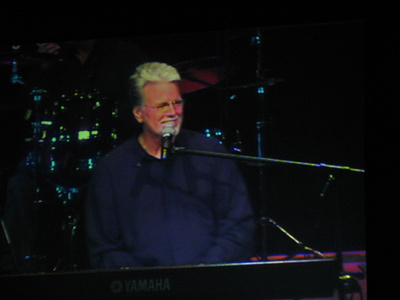 The song was written by Larry Shell, Steve Gulley, and Kim Williams, and is one of Con's favorites. The song tells a story about finding out what is really important in life. Con's favorite line in the song is "..the most important thing in life ain't a thing at all." He comes downstage to get a little closer to everyone as the words and the music embrace the entire audience. A beautiful performance, and an inspiring message! Deeply moved by Con's message and delivery, the crowd responds with a rousing ovation. His brothers and sister are equally moved, and Con is touched by the heartwarming response. Con's good friend Kim Williams attended the performance. Kim co-wrote "Hollow Man". He and Con have developed a strong friendship, and have even been writing some killer songs together for Con's next CD. Con is honored to be working with him, and proud to call him "friend". 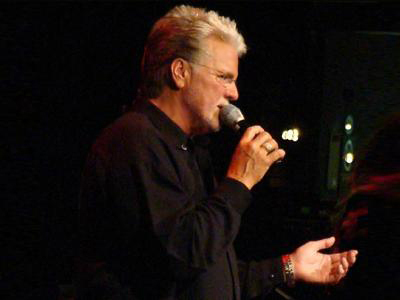 Kim is one of the industry's most sought after songwriters, and has won just about every award there is! The list of artists who have recorded Kim's music is way too long to fit in this short space, but Garth Brooks, Kenny Chesney, Reba McEntire, and George Strait are just a few. 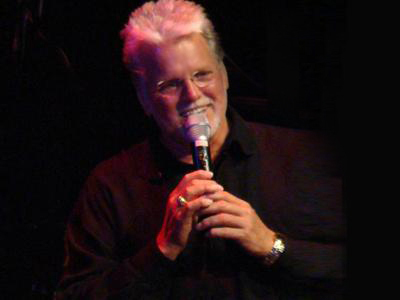 Williams also penned the Randy Travis hit "Three Wooden Crosses". In the lobby folks are lined up to say "Hi" to Con. Con stayed to meet and greet fans for more than 2 hours! This young man was very excited to attend the performance. He is a big Con fan! 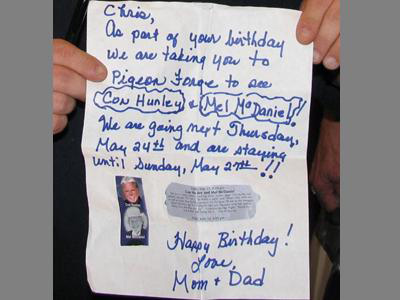 His parents surprised him with tickets to the show as part of his birthday. 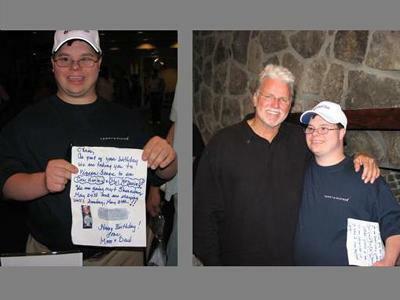 While he was standing in line to see Con he was holding the letter his parents had given him. Below is an up-close view. What a great way to end a fantastic evening! !